Love Thy Baby focuses on meeting the needs of infants who are born into health or economic crisis. 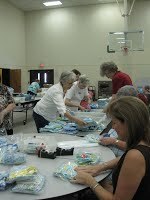 LTB volunteers sew, quilt, knit and crochet quilts, blankets, clothes, hats, booties, and other baby items. Many of our volunteers work from home, others attend workdays and meetings where they work together. New volunteers have the opportunity to enhance or learn these valuable skills. For those who are not interested in sewing, knitting or crocheting, we also need volunteers to iron, cut squares and patterns, tear flannel, and sort and count donations. Visit one of our weekly workdays or one of our monthly meetings to get plugged in! Between them, Parkland Health & Hospital System and John Peter Smith Hospitals deliver more than 18,000 babies a year. Statistics show that 85% of these infants are born in need. Most parents are the working poor of our community. Our goal is to provide each baby in need with a blanket or quilt, a shirt, a hat, and a pair of socks or booties. Deliveries are made every month in an effort to meet the needs throughout the year. Each year, hundreds of babies are admitted for care in the Neonatal Intensive Care Unit. Using custom patterns, we make and donate soft shirts, hats, and other items for these tiny babies. The most heartbreaking need we must provide for is the burial layettes for the babies who lose their fight for life. Special volunteers dedicate their time and skills to create beautiful gowns and accessories to ease the trauma of the families of these infants. In addition to Parkland and JPS, donations are provided through PediPlace in Lewisville and a number of agencies, including Hope 4 Refugees, Sharing Life, Nexus, Family Place and White Rock Center of Hope. Donations are generously provided by volunteers, individuals, and organizations who give their time, talents, money, supplies and baby items. We are challenged each month to meet the growing needs. We would love for you to join our efforts. There are many ways you can help. Use your sewing, quilting, knitting, and crocheting talents to make clothing, blankets, and more at our work meetings or work from home. You can also contribute at the work meetings by cutting, ironing, designing and sorting. Learn to sew, quilt, knit or crochet from our experienced volunteers using tried and true patterns for free at a meeting. Make a much needed financial donation to help with the purchase of fabric, quilt batting, yarn, and sewing supplies. We can leverage your gift to make much more than money can buy at retail stores! The Parkland team had challenged us to help by delivering more warm blankets in 2014 and our volunteers executed on the challenge. We delivered a record number of 2,439 quilts during the year and broke our monthly record twice, first in October when we delivered 240 quilts in one month, and again in December when we delivered 295 quilts in a single month! With our growth in fundraising, we were able to start purchasing fleece on a regular basis to make more fleece blankets. With our growth in volunteers, we delivered stellar results across the board on the handmade items that are the primary work of our organization. Given the significant number of babies born at Parkland each month, they are our primary focus for distributing the items we make and collect, but with our growth in 2014, we were also able to donate items to JPS as well as increase our donations to the agencies that we work with in East Dallas. These amazing results are only possible because of our wonderful volunteers who work tirelessly every month at home and at our work meetings to create beautiful items to cloth and warm the babies born in need here in the DFW area. In addition to our volunteers, we have so many generous donors who have helped us to purchase materials and sewing supplies and have donated beautiful sleepers, onesies, socks and other care essentials. We are very grateful for sponsorships like DFW Fiber Fest, TPHCCA Conference, and DFW Yarn Crawl that allow us to share our story with a broader audience, companies like Texas Instruments, Dell, and Berkley Specialty Underwriting Managers who so generously give back in the communities they serve, and organizations like Northaven UMC, Irving Quilt Guild, Coppell Women’s Club, Farmer’s Branch Women’s Club, Webb Chapel UMC, and so many other local groups who continue to support our efforts year on year!